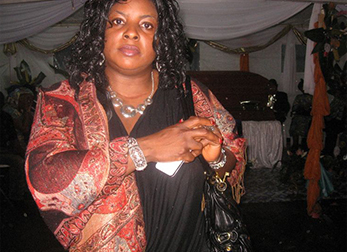 In life she had no biological children of her own but her death proved that she had used her voice to deliver a mammoth crowd that showed up at her wake yesterday at the Limbe municipal stadium. It is this crowd with persons cutting across every ethnic , age and gender grouping that welcomed the casket carrying the remains of the polyglotic singer born Elizabeth Bessem Manga. 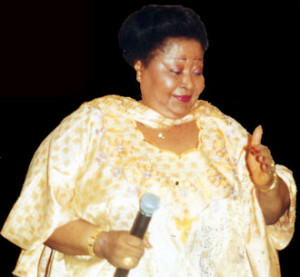 Her mortal remains entered the municipal stadium to the sonorous sounds of the brass band churning popular gospel tunes. It was a hair raising moment. By 10.30 pm Elizabeth Bessem Manga alias Bebe Manga lay in state, her body resplendent in a queenly lavenda outfit befitting the grand diva that she was. Her baby face did not lose its charm in death; her beauty still shown through in spite of her earthly transition to the world beyond. Her gilded casket seemed at home amongst the carefully chosen fresh flowers that graced the canopy which had become an instant shrine. As some dignitaries took their turn in viewing the remains of the diva, the roving ambassador/artist Roger Milla flanked by veteran artists Sam Mbende, Sam Fan Thomas, Henry Njoh and Nkotti Francois made their entrance into the municipal stadium. It was now time for Bebe’s artistic family to mourn her with the rhythms that had formed an integral part of her life. Ms. Mary Mandi opened the way; a consummate guitarist, she tickled the guitar strings and the resulting sounds accompanied her velvety voice in her hit song “Na Wetin Be Man” to the thunderous applause of the crowd. Her song underlined what The Preacher had so succinctly captured in Ecclesiastes, “vanity of vanities; all is vanity”. Then came the makossa maestros in succession, Sam Fan Thomas, Djene Djento, Axel Mouna, Charlie Nelle Emile Kange, Nkotti Francois, Njoreh, Ann Nollo including stars of other musical genres like Ateh Francis alias Bazore. As each artist hit one of his or her signature tune, Bebe Manga’s children a.k.a her fans went into a frenzy. 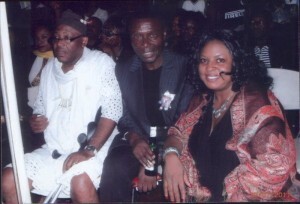 Like a Greek chorus the fans’ chants, shouts and tears reaffirmed that Bebe Manga had indeed lived a fulfilling life. She had enriched the earth and the earth was already missing her. Some of her songs like Amio, Esele Mba, Djiya Kamba, Na meya made their mark. I was moved and could not resist joining these artists to celebrate the woman whose poetic flair had put the kenyang language on a world stage. It was therefore only normal that I should acknowledge her achievement in this regard with a performance in Kenyang. With the band playing Bebe Manga’s Amio in the Background, I launched into a monologue celebrating the golden voice which had not only given her the children she did not have but a voice that paved the way and narrowed the African continent as her music quickly made rounds from Ivory Coast, to Senegal, Burkina Faso, Mali, Equatorial Guinea etc. By the time I was leaving the stadium, the voice of Njume Loko trailed me, and Bebe’s casket was now closed and ready for the journey to her final resting place in Tinto, Manyu Division, but the verdict was already written in the early morning sky: Bebe Manga’s voice will live on because it has been trapped in time and will never die! !